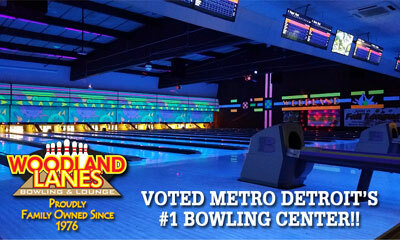 Welcome To Woodland Lanes - Voted Best In Detroit by WDIV! We're not just any ordinary Bowling center... we're so much more! We're proud to be consistently voted as Metro Detroit's #1 Bowling Center (WDIV "4 the Best" 2008, 2009, 2010, 2012, 2014, 2015, 2016, 2017 / Detroit A-List 2011), as well as Livonia's #1 Bowling Center! We are also proud to be Livonia's only family owned and operated Bowling center. Number one in fun, Woodland Lanes is your party center for distinctive events for all age groups. We're the place to be, because we boast state-of-the-art facilities, complete with 32 Synthetic Bowling lanes featuring Brunswick Frameworx automatic scoring and automatic bumper system, a great kitchen (with two Pizza ovens), two newly remodeled cocktail lounges, a pool table, darts, video games, a great pro-shop, and a friendly staff for all your needs. The Management and Professional Staff at Woodland Lanes are ready and waiting to help you plan and celebrate the perfect event, such as an elaborate corporate office party, a unique fundraiser, or a child's fun birthday party; each complete with great food, fantastic bowling and a super entertainment opportunity.